This Must Be the Place, the Sean Penn film shot here this year, may or may not get great reviews when it opens. 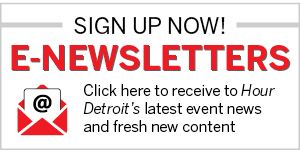 But what has already garnered superlatives is the on-location fare served to the cast and crew while they were filming in Detroit. The company that provided the sustenance is Chow Catering, a name that has become well known within the film and commercial industry in a very short time. Dan Gearig founded Ciao six years ago, which became Chow in 2008, after being tipped off by Bryan and Megan Meganck, friends who had a snack business and saw the need increasing for good caterers. It was before the tax incentives brought filmmakers here in droves, and Gearig has seen what was a minor business take off. Chow, based in Madison Heights, has catered at least 25 major film productions, including You Don’t Know Jack, Harold and Kumar 3, and The Transformers, plus music-video shoots with Kid Rock and Eminem, and commercials for Ford, Chrysler, and Nike, among others. As movie cameras and crews multiplied in metro Detroit, so did Chow’s reputation for the quality of its food — not trucked in, but cooked on-site in one of the two fully equipped, custom-made catering trucks (purchased used, appropriately enough, from Los Angeles caterers). 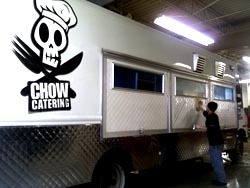 The trucks are emblazoned with the Chow logo, a Jolly Roger in a chef’s hat with crossed knives and forks rather than crossbones. The trucks sport complete kitchens with 6-foot flat grills, steam tables, and six-burner gas ranges. The food is made “as much as possible with fresh local ingredients,” says Gearig. The menus change daily.